When it comes to camping gear, it’s the big-ticket items that get all the glory…tents, sleeping bags, cookware, and the like. All important and necessary equipment, of course, but it’s often the little things that can mean the difference between a satisfying trip into the great outdoors or a miserable, aggravating outing. We’re always on the lookout for those little things that can improve our camping experience—items that won’t break the bank, but can significantly ramp up the enjoyment factor. Several weeks ago, we came across a brand we had never heard of before called AceCamp. The several items on display looked like quality products, with professional grade packaging and price ranges that sat in that confident middle ground. We’ll be the first to admit that there are about a gazillion tent lights on the market, ranging from outright junk to over-engineered and over-priced items we’d never lay out good money for. 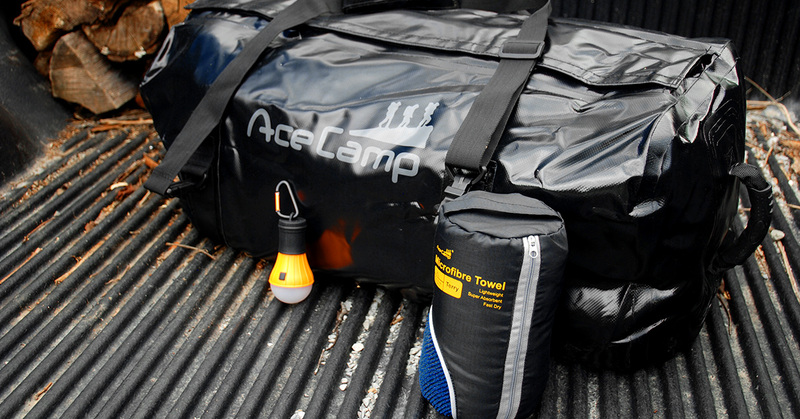 The AceCamp LED Tent Lamp is neither of those extremes. What first caught our attention was the overall design. It’s shaped like a conventional light bulb, but don’t think that’s a result of some product engineer trying to be cute. The shape has a function—specifically, the translucent globe at the bottom delivers a soft, widely dispersed light that’s perfect for a tent environment. Three AAA batteries power the LED light array inside the globe, which is activated by a single push-button switch. The lamp has three steady light modes—high, medium, low—and a strobe setting. We use the low setting for our single- or two-person tents since it offers plenty of light for organizing our stuff and reading. 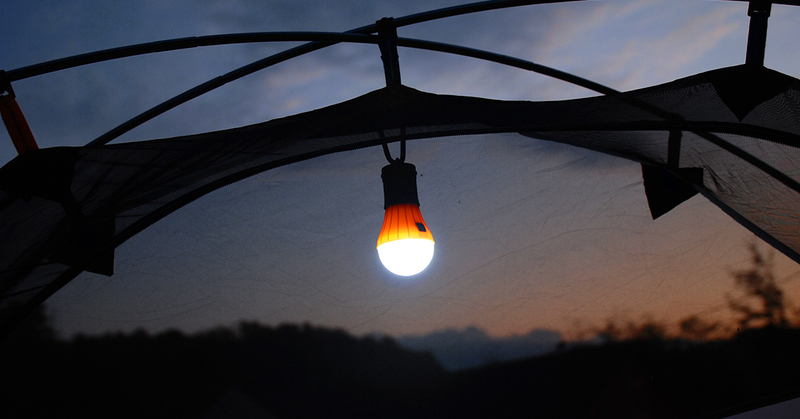 For cabin tents, turn the lamp to the high setting for wall-to-wall illumination. Overall construction is solid. The screw-off base that secures the battery pack inside the housing has a rubber overmold that’s easy to grip, and includes a carabiner so you can clip the light to a tent loop, guy line, or even hang it from a branch for outside use. The unit weighs a scant 3.5 ounces and is small enough to fit in any pack. Because of its small size and durable construction, we’ll be using this not only for park-and-camp outings, but also our upcoming backpack trips. With an MSRP of $19.99, this is one of the best uses of a Jackson we can think of. 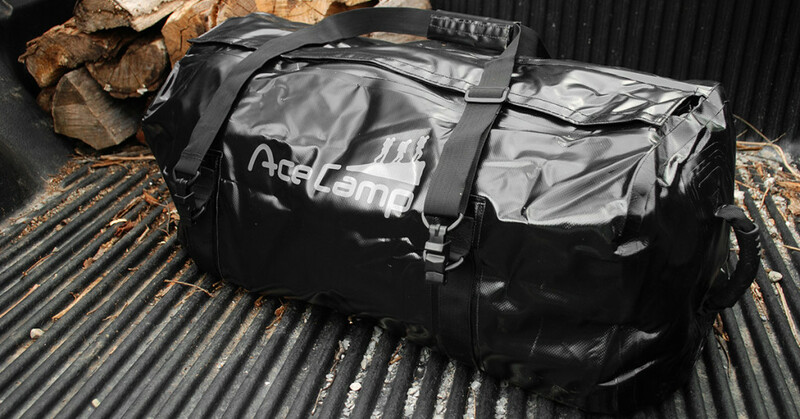 The AceCamp Vinyl Dry Duffel Bag is not a conventional “dry bag”—meaning you don’t want to take it on a class IV whitewater adventure. The duffel material is waterproof, and made of a heavy laminated vinyl that will keep your gear safe and dry on soggy ground or in the back of your truck during a downpour. A coated and taped zipper provides access to the interior. The zipper resists water penetration, which is why the bag is not submersible, but it is highly water resistant. Two flaps overlap the zipper and stay secured with hook-and-loop strips to keep rain from entering the bag. The Vinyl Dry Duffel Bag comes in two sizes: 40-liter (23.6×11.8 inches) and 90L (29.1×12.9 inches). We chose the latter, and found it to be large enough to stow all of our gear for a long weekender in the high country—clothes, food, med kit, pillow, light, and assorted gear. Large handles on both ends of the bag make it easy to haul it in and out of your vehicle, while a detachable shoulder strap lets you tote the bag to and from your camp site. AceCamp offers the bag in three different colors. We chose black just to keep things looking clean.We regret not having purchased a bag like this years ago. A rectangular duffel is much more convenient to store and access our gear than it is with a backpack (plus we can get more gear in the bag). Now we can toss the bag in the back of the truck or Jeep and not worry about staying dry. We also don’t have to lay out a ground tarp to set everything on in case the ground is wet. Big problems solved by a simple solution! We’ve picked up a couple of “camping towels” in the past, and quit using them after the first trip. Seems as if most manufacturers think a camp towel has to be made of non-absorbent synthetic materials to prevent bacterial growth. Sorry, but we’re more about getting dry than fighting invisible bugs. AceCamp made their Terry Cloth Microfiber Towel to get stuff dry, and thanks to its highly absorbent fibers and terry loop knit fabric, it does so quickly and efficiently. 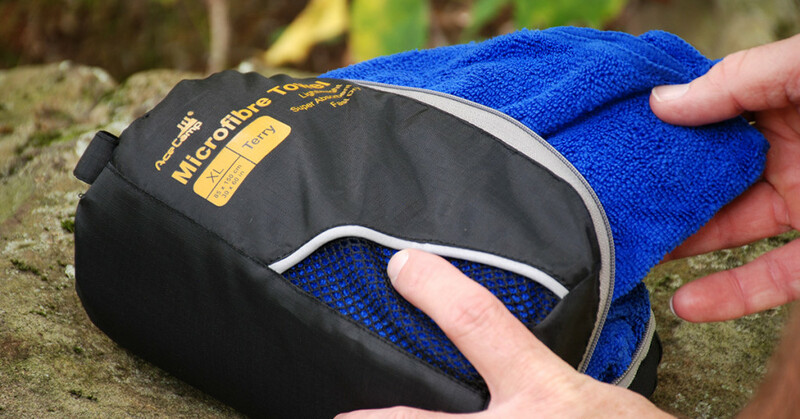 While any good towel will do the same, the big advantage from a camper’s perspective is that this towel rolls up and stows in its own zippered nylon pouch. The pouch has a mesh panel to allow the towel to dry out and prevent (ack!) bacteria from developing over the course of your trip. It worked great for us for morning cleanups and regular hand-drying, and it pulled duty as a dish dryer. We purchased the XL model (30×60 inches) for $24.95. That’s larger than your usual (read: small) camp towel, and one we can actually wrap ourselves in after a dunk in the lake. In retrospect, we should have also thrown in the small model for $7.95. That’s a minor price to pay for not having to dry your face with the same towel you used to dry the frying pan the night before. EDITOR’S NOTE: You can purchase these and other AceCamp products direct from the manufacturer by visiting their website.